I seem to have a thing for white Pilot-branded writing instruments. First it was the Pilot Prera, still one of my favorites. I followed that up with the Pilot Fumi Raku, which turned out to be more of a mixed-bag. First, some background on the Fumi Raku brand. I gather that this is a brand intended primarily for the Japanese market, since English-language information is pretty hard to find. The name comes from a combination of the Japanese words fumi (writing) and raku (ease). There are 10 varieties of metallic and pearlescent color Fumi Raku ballpoints available, as you can see on Pilot Japan’s official Fumi Raku product page. There is also a Fumi Raku mechnical pencil that uses the same body; it is available in 3 colors. Quite the lineup! Finally, there is the flagship Fumi Raku product: a more expensive edition of the ballpoint pen made with a combination of wood and other special materials. Pilot refers to these as the Fumi Raku “Modern Japanese” pens, and there are two color/material schemes: one white/walnut (called “Touki”, pronounced like TOE-key) and one black/red (called “Nanbutetsu”). This review is for the Fumi Raku Modern Japanese Touki (white) ballpoint version, and I’ll just refer to it as simply “Fumi Raku” from here on. I’ll get into the significance of the Touki name later in the post. I had never heard of the Fumi Raku until I stumbled across it while visiting Tokyo. I think it may have been a small stationery kiosk deep in the maze of Shinjuku station where I first spotted it, and I was immediately struck by its brilliant design. There was a display model and I was able to hold the pen and admire its build quality. The problem? It was a ballpoint, something I don’t normally use. Still, the style of the pen interested me enough that months later, after seeing the Fumi Raku again at a local shop, that I decided to take the plunge. Let me start my review by getting the negatives out of the way: the Fumi Raku is a ballpoint pen. A fancy and pricey one, to be sure, but there is nothing ground-breaking about the writing performance. Like ballpoints in general, it tends to skip, especially when starting. The ink is a weak black, compared to much darker and richer gel and fountain pen ink alternatives. What I notice most about the Fumi Raku’s standard 0.7 mm black refill (the Pilot BRFN-30F-B) is that it is very smooth – excessively so. I am not a regular ballpoint user, so I’m not sure if the BRFN-30F-B is better or worse than your typical refill. But my impression is that writing with the Fumi Raku is like writing on slick, perfectly smooth glass. For someone like me with tightly-controlled, printed handwriting, the point of this pen is way too slippery. It feels like the line is running away from me, and my writing ends up looking sloppy. If you have wide, flowing handwriting you might appreciate this. For me it works really well as a signature pen, but not as well for everyday writing. But enough about performance: the reason I became enamored with the Fumi Raku is because of its looks. It is an absolutely stunning design. The grip is real wood, impressively smooth and with a nice dark walnut color. Details are bright chrome, including an extremely tight and strong clip. The end of the body stops at an abrupt angle instead of a symmetric taper, giving the pen a modern, slightly futuristic look. Juxtaposed with the retro wood accent, this is quite a head-turning product. 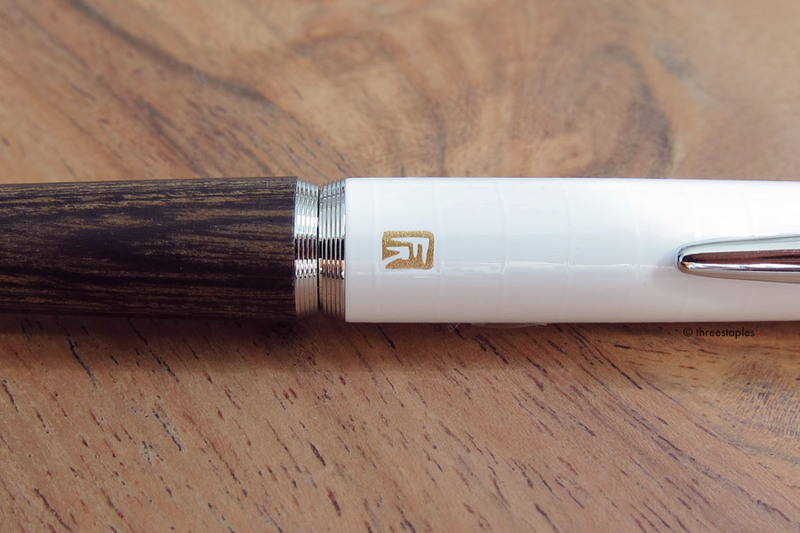 The Fumi Raku is a retractable pen, and the mechanism has an excellent feel. A gentle twist of the barrel extends the tip. The twist action is spring-loaded and offers a nice bit of resistance. Then to retract, just a gentle nudge in the opposite direction is all that’s needed: the spring takes over and the pen gently and smoothly completes the rotation all by itself. Trust me, you'll want to do this over and over again because it feels so luxurious and satisfying. And the real achievement of the design is the glossy white finish. This model of the Fumi Raku is appropriately named Touki (陶器), which means “ceramic” in Japanese. 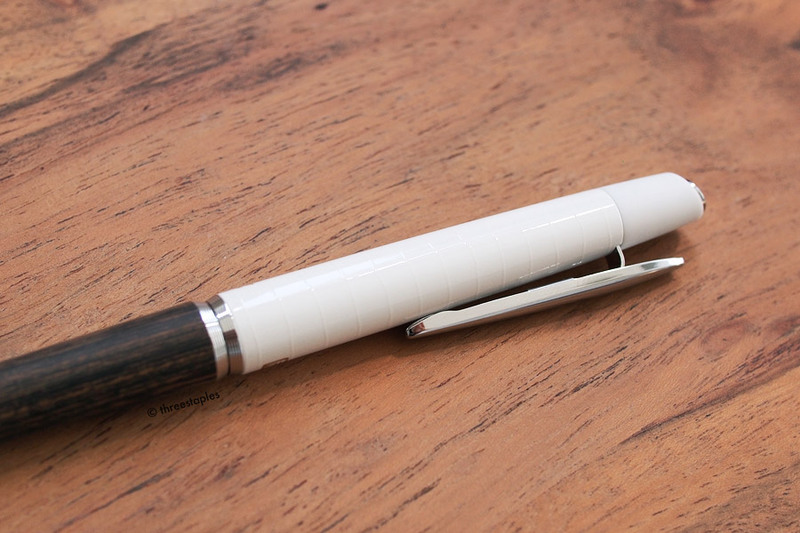 The pen’s white body is not real ceramic – it’s actually aluminum. But Pilot has crafted a glossy white finish that gives it a glazed, multi-layered, ceramic-like look. It makes my trusty white Pilot Prera seem almost cheap and plastic in comparison, which is hard to do. The Fumi Raku is definitely a level up in terms of materials. If you look closely there are fine, uneven ridges in the material, giving the impression of hand-made porcelain. And the entire pen is rather heavy for its size, making it seem that much more precious. Carefully stamped on the surface are the tiny words PILOT JAPAN on one side, and the Fumi Raku insignia on the other, both in a subtle gold metallic ink that glitters in the light. The logo at first appears to be in the style of a traditional Japanese seal, but upon closer inspection is a stylized combination of the the English letters “F” and “R”. The only imperfection of the design, if I can say that, is the very top, the last 1 cm or so of the body. Perhaps for manufacturing reasons, the material here is a dull white matte plastic. Visually, it works with the overall style, but up close it seems a little out of place compared to the much classier and impressive wood, chrome, and enameled materials on the rest of the pen. In conclusion: the Fumi Raku Touki has a wonderful and unique design, and it feels great in the hand. However, it writes like a normal ballpoint pen, and for that it can be hard to justify the price tag ($85 USD). I rarely actually use it to write, but I am happy to admire it on my desk, and I pick it up every now and then to enjoy the details. Maybe one day I’ll figure out how to hack in an alternative gel or rollerball refill. Until then, it’s my “special occasion” pen, not a “work” pen or an “everyday carry” pen. And that's still perfectly fine by me.